By the time Queen Victoria slipped the kohinoor on her wrist, the gem had travelled around the world, changing hands over the centuries from one ruler to another in Persia, Afghanistan and India. The fascinating story of this 105-carat diamond opens in 1830, when the Indian Maharaja and founder of the Sikh empire, Ranjit Singh, takes possession of the massive jewel that has been passed from man to man, king to king, and emperor to emperor, through bloodshed and destruction, since the 1200s. When Ranjit Singh dies, four of his sons are slaughtered in wars with the British and the diamond is left to Prince Dalip Singh, a six-year-old child. The British governor-general orders that the Mountain of Light be secreted out of India in 1850, and the teenage-king Dalip Singh follows the diamond to London to officially present it to the queen as a spoil of the Sikh War. He is fêted and petted by the British monarchy for a long while—until he realizes that all that Britain gives him cannot make up for the loss of his country and its celebrated diamond. Told in her inimitable trademark style, Indu Sundaresan’s The Mountain of Light is a wondrous and historically rich tale, as clear and as dazzling as a diamond itself. HarperCollins Publishers India Ltd. is a wholly owned subsidiary of HarperCollins Worldwide. HarperCollins India has shown phenomenal growth in the past few years and publishes fiction, non-fiction and poetry by diverse writers like Nayantara Sahgal, A.P.J Kalam, S. Radhakrishnan, Kamala Das, Kunal Basu, Tarun Tejpal, Deepak Chopra, Ruchir Joshi, Rana Dasgupta, Kiran Nagarkar, Meghnad Desai, Mukul Deva, Jaishree Mishra and Anita Nair. It has also successfully built a list of talented first time writers including Advaita Kala, Anuja Chauhan, Karan Bajaj, Jahnvi Achrekar, Amitabh Bagchi, Kishwar Desai, Pallavi Aiyar and Ameen Merchant. HarperCollins India is also the publisher of The White Tiger by Aravind Adiga, winner of the Man Booker Prize 2008. 2. Giveaway is restricted to India only. 3. Giveaway will be valid only for 24 hours. 4. Decision taken by the judges will be final and cannot be disputed. 5. The contest is open to all residents in India, albeit residing in places where couriers deliver. 6. Only entries in English will be considered eligible for the contest. 8. 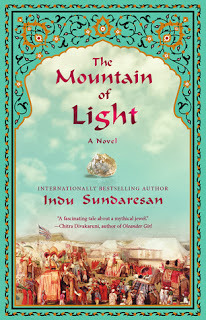 The winning entries will win a copy of The Mountain of Light by Indu Sundaresan. The book would be sent within 2-3 weeks after the result is declared. Winner shall be kept updated about the same. 9. Submitted entries should be your original work; no plagiarism shall be entertained. 10. Multiple entries are not allowed. How important is social media presence for an author? Came here via Indu sundaresans FB page… have submitted my entry.